Here is my list of shops and stores to visit. The keywords to look for are “ricami”, ” filati” and “tessuti”. There are so many fabric and haberdashery stores but I am just enlisting the stores which cater primarily to embroiderers and needleworkers (including patchwork, which I will soon explore too!). 1. 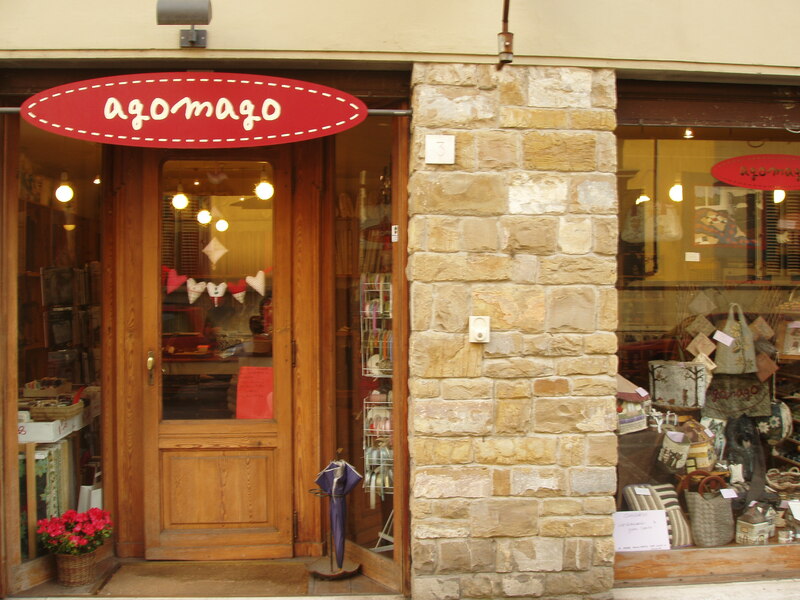 The best needlework store that I have visited is the Agomago in Via Arnolfo 3-red. 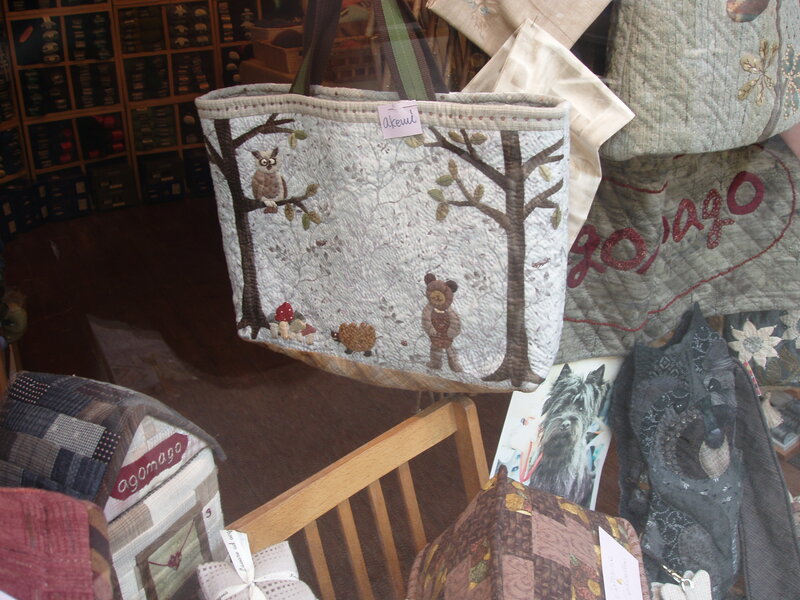 They mostly sell patchwork and quilting articles, japanese needlework products and books. They have embroidery products and books in a small room. I bought products which inspired me and which I can´t find in Berlin. The store ladies are helpful and kind. The store is owned by 4 ladies, including a japanese lady. They can speak english too. They have helped me with the colors, because I am color-blind. 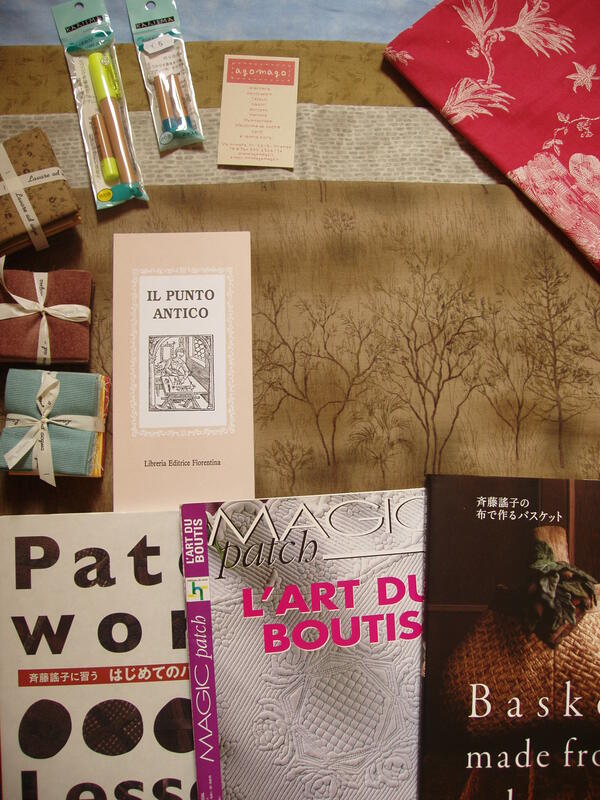 I bought a couple of japanese books on patchwork which I will blog about in my library blog. They also display their finished patchwork projects, which are so inspiring, that I decided to try patchwork, appliqué, quilting and ribbon embroidery soon! I really like the japanese fabrics. But they are starting to be a favorite among needleworkers so I hope these japanese fabrics will soon be widely available. The street is off the center but it is not far. It is still walking distance from the dome. Find the location in google maps. 2. The next store that I also like is the Mirko Filati di Campi Antonella e Barbara, which is located in Piazza San Lorenzo 35-red. Though the entrance is small, it is actually a large store. The store lady has been very patient that I am colorblind. She can speak good english. At this store, you can start paying with credit card if your purchase is 20€ up, so be sure to bring cash. I bought products I have not seen before, which inspired me in my projects, like the raffia and a knitting yarn which can be used to creat interesting textures. Here I find rare DMC products like the cord, the satin (like rayon, but different) and scented threads. There are no DMC products in Berlin stores, so I bought what I think I needed. 3. Then there is the Campolmi Roberto Filati, which is located at Via Folco Portinari 19/21-red. I have tried to come there 3 times but I seem to visit during the long lunch-breaks . They are also closed Saturday. 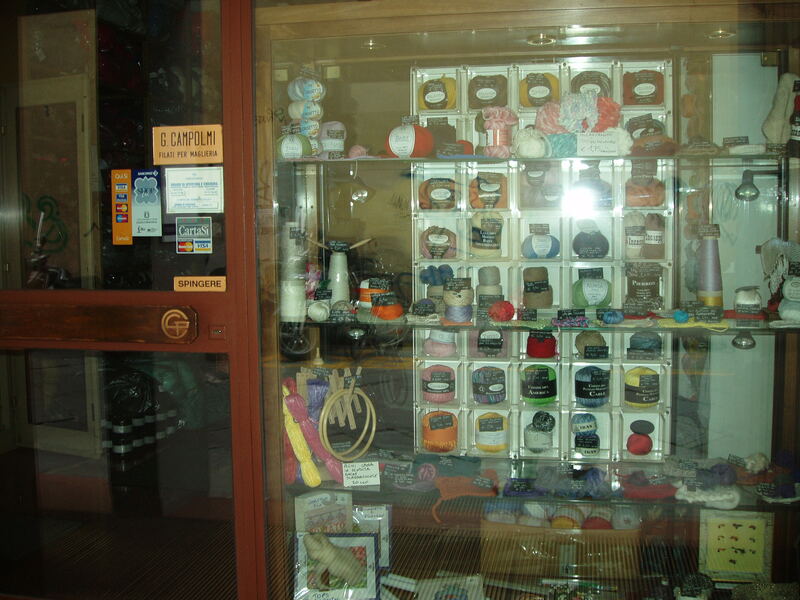 But this store has the largest collection of knitting yarns, including hand-dyed, which are my favorites. I only bought the variegated Madeira cotton threads, which are very affordable. But if I have more luggage space for the bulky yarns, I would have bought the hand-dyed yarns (both cotton and wool), which are not available in Berlin. Their prices are generally cheaper than in most stores, I think. And they have lots of yarns to choose from. If you are also a needlepoint kit lover, there are some which are affordable, including a stamped Aida design of Florence itself. I wanted to buy it, but I have no more luggage space. 4. 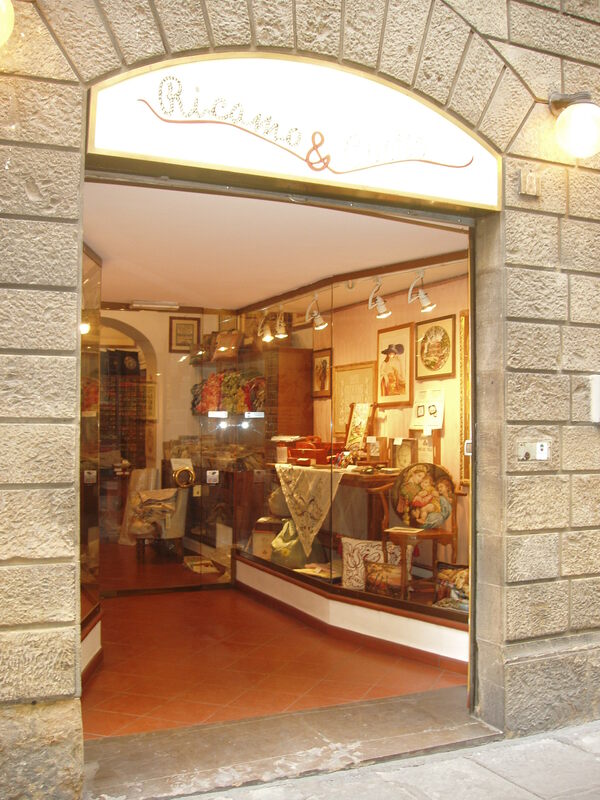 Then there is the shop Ricamo and Cucito at Piazz dell`Olio, no. 20. 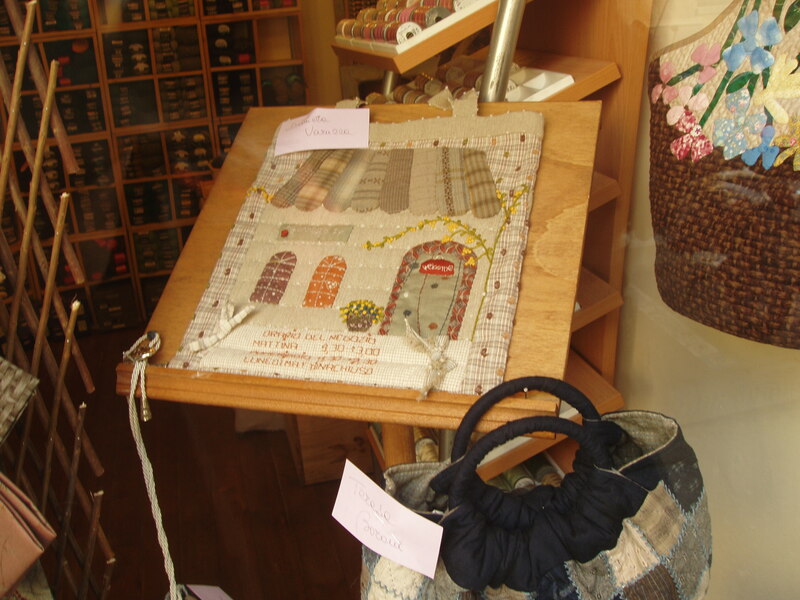 This store has an attractive window display of finished needlepoints and cross stitched embroideries. There are kits, like those from Dimensions and Permin of Copenhagen, including hard-to-find designs. I started to like and collect these kits when I was making lots of cross stitched designs years ago. They have hundreds of patterns, mostly from the US. 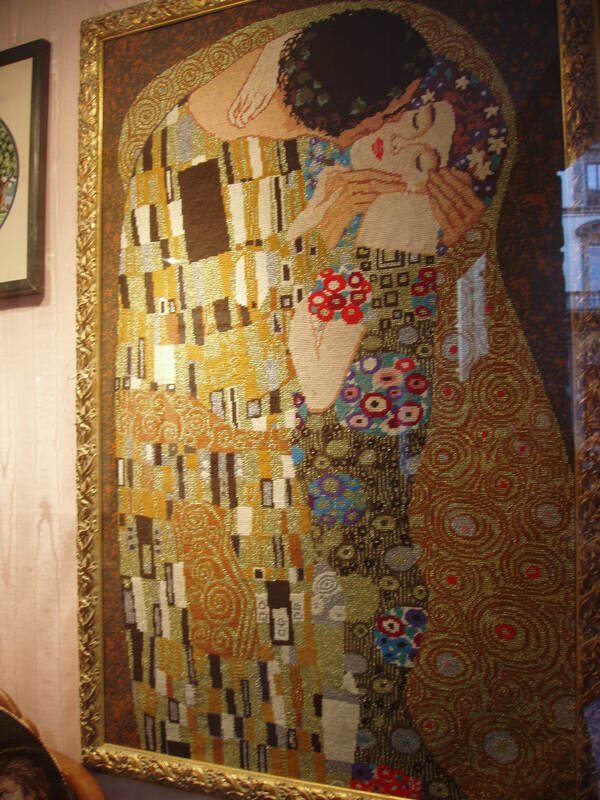 What I really find inspiring, are the displayed embroideries. You get to see how some of the kits are finished. I really like the very fine Boticelli Madonna needlepoint (faces and skin are in petitpoint) and the very large Klimt needlepoint which also uses gold threads, just like Klimt used gold in his paintings. 5. 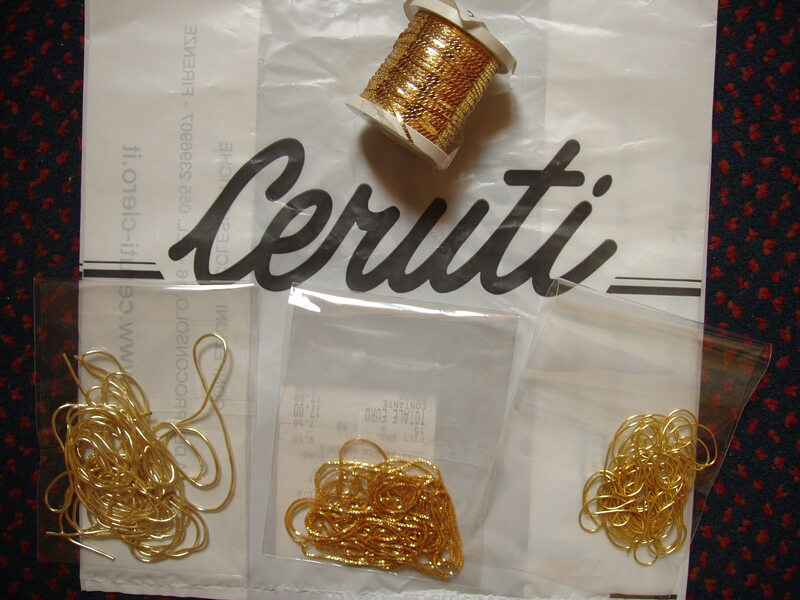 Ceruti is not an embroidery store, rather it is an ecclesiastical store, that happens to sell finished goldwork embroidered articles, like those that are used to cover the priest´s cup during the mass. And guess what, they also sell silver and gold threads. Because I have not found any gold threads in Berlin, I bought 4 kinds of non-sewable threads (has to be couched or used as beads). There is a swatch of samples to choose from. 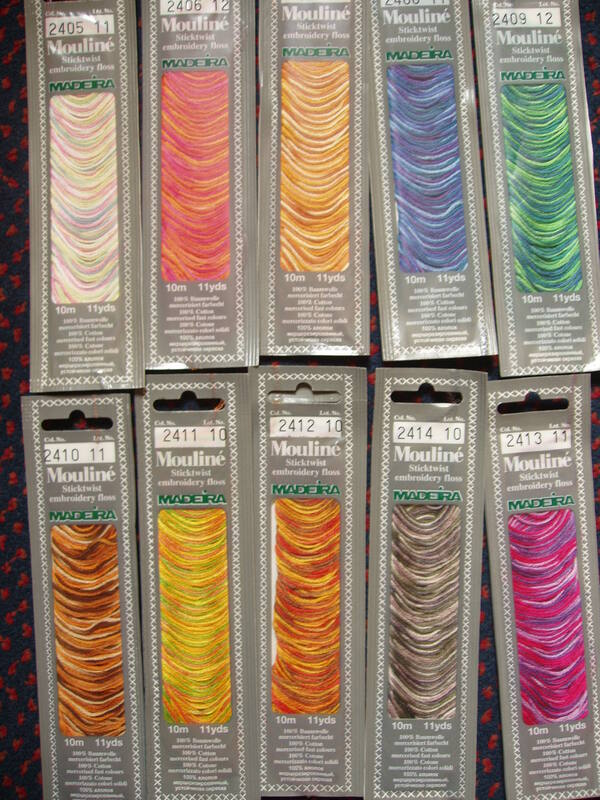 I want to buy the finer sewable gold threads, but I am just sticking to my affordable metal threads at the moment. 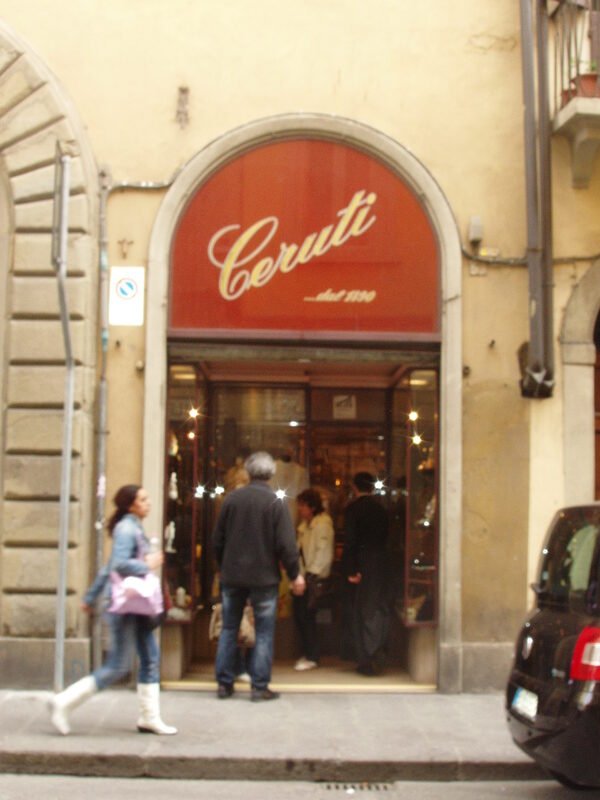 Ceruti is located at Via del Proconsolo 16. 6. 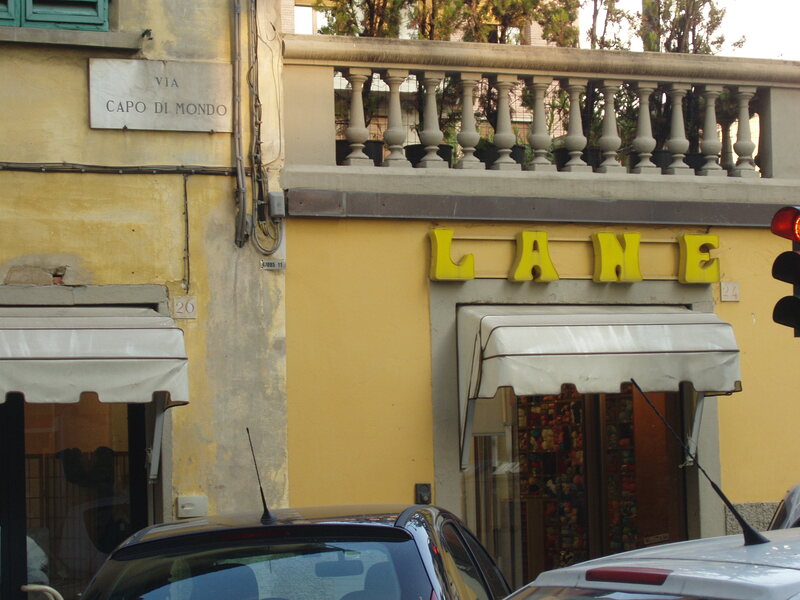 Then during my walks off the center, I found this small yarn shop at Via Capo di Mondo 24 r. Lane is owned by a small old lady who does not speak english. She had hundreds of yarns, but I find the vintage (“out-of-print”) yarns interesting, because I have not seen them before. It was difficult with the language. That is when I decided to learn at least the names of the colors: red-rosso, pink-rosa, blue-blu, violet-violetta, black-nero, yellow-giallo, orange-aranzio, green-verdi, brown-marrone, grey-grigio, silver-argento, gold-oro. 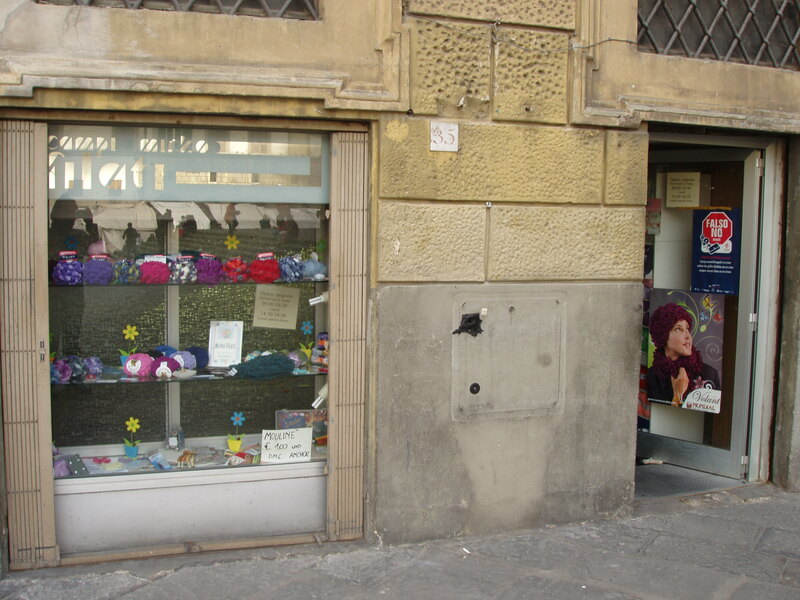 You might find other stores, that has machine-embroidered linens and clothings, like Busatti in Lungarno torrigiani 11 (on the way to Piazza di Michelangelo) and Loretta Caponi in Via della Belle Donne 28-r (the main door is on another Street, I forgot to write it down). These two stores sell high quality machine-embroidered home textiles (pillow cases, aprons, etc) and clothing. 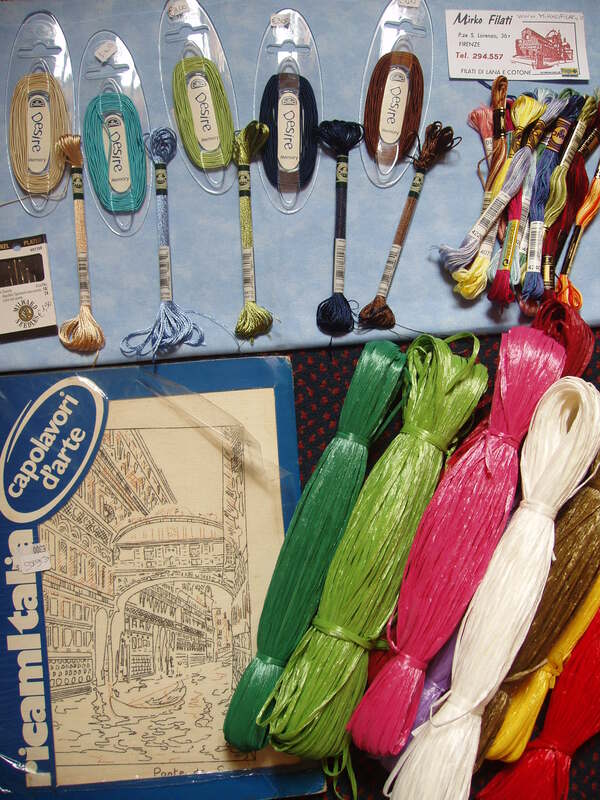 I just happened to be more interested in products I can use in my needlework or products that inspire me. 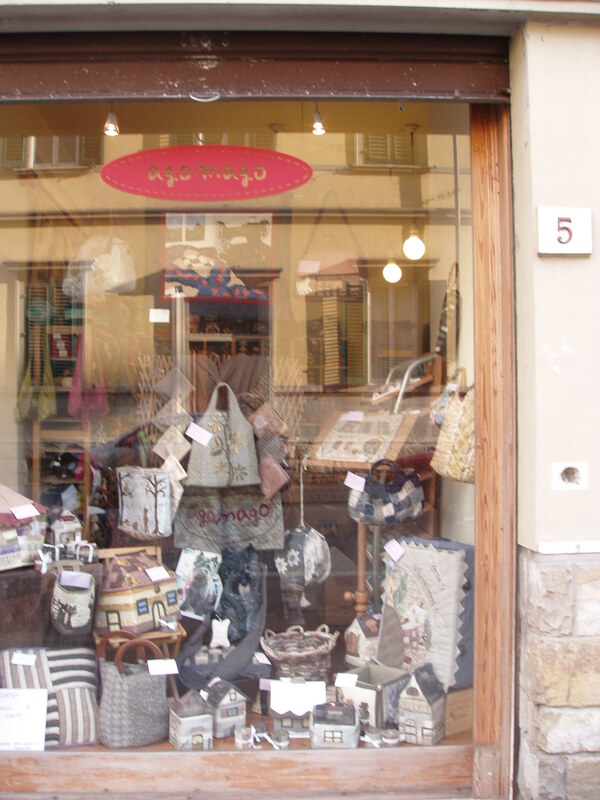 There are also lots of Textile (tessuti) shops, which only sell fabrics, but I will not blog about them. 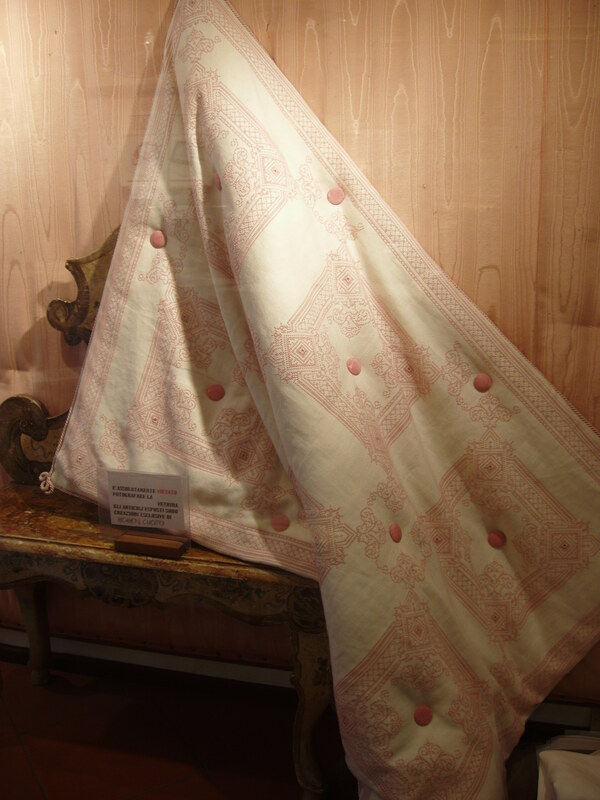 I did take the time to look at the fabrics, but most of the linen and silks I can also find in Berlin. 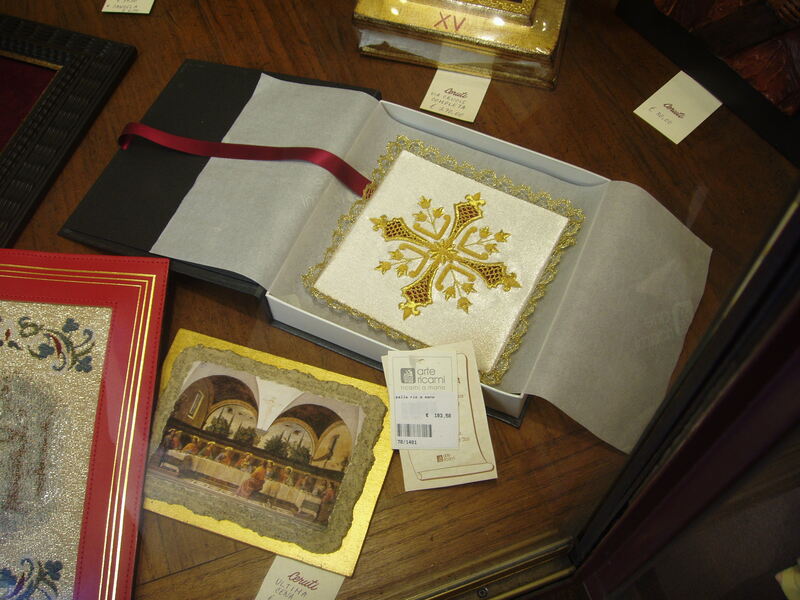 Special thanks to Jeanine (Italian Needlework) for the information about Florence in her blog! Thank you so much for your information. I am planning a quilt tour to Italy and will definately look into your suggestions. 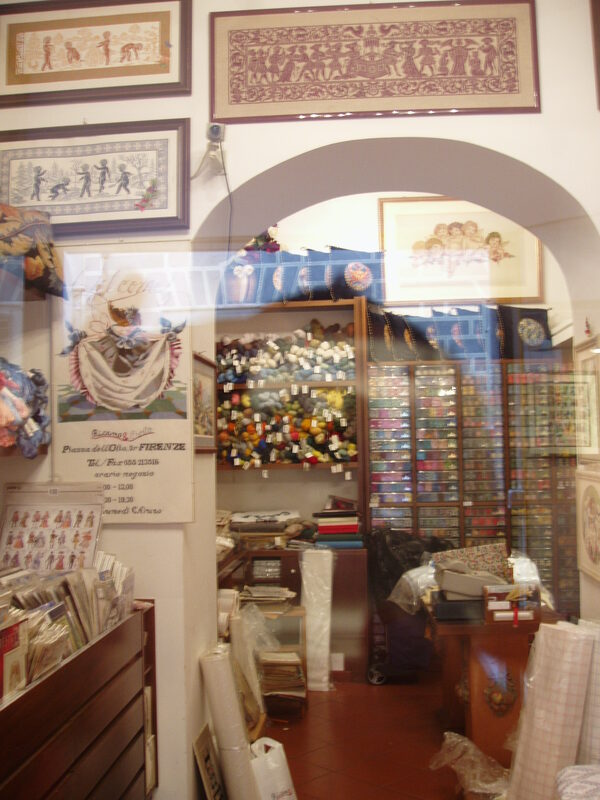 I am going to Italy next week and the info on Florence needlework shops is very helpful. We are going on a three week vacation to Rome, Florence, Venice and Milan in March. I will be sure to take your list with me!! First of all thank you for a great blog. I am studying textiles in Denmark, with a focus on embroidery, and will in the beginning of May be going to Florence alone on a research trip. 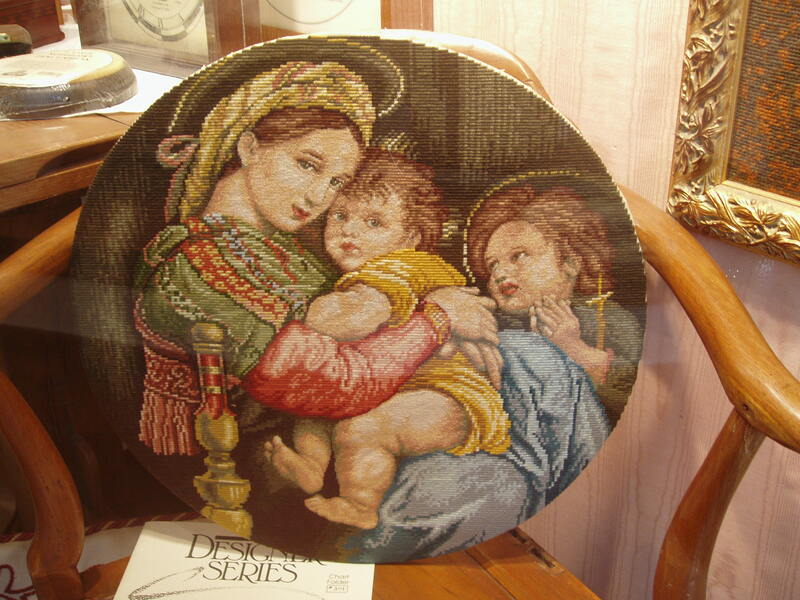 My hope is to find some traditional studios where they still practise the original Florentine Embroidery / Bargello. Did you happen to come across anywhere that had a focus on the flame/bargello stitch on your trip? If not, were there any of the places that you visited featured in your blog, where the staff was good at English – if so I will write them, and perhaps they could mention a few studios. My plan is to write about it and try to get it published in a creative magazine here in Denmark.